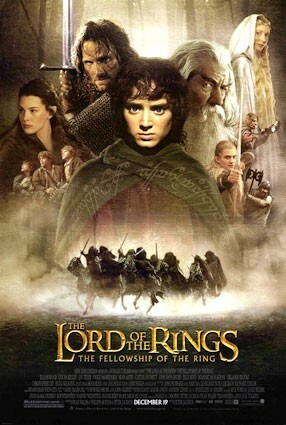 The film is about a ring made to invade the Middle-earth. In time of battles and chances, the Ring was passed and passed until it went to a man named Bilbo Baggins who has a nephew, Frodo. When Bilbo left their place, Frodo had the Ring. Wizard Gandalf, seeing what had happened, tried to connect the pieces about the mystery of the Ring, only to find out that the Ring Frodo has is actually the Ring made by the evil Sauron. When Saruman the White finds out that Frodo has the Ring, he tasks all to get the Ring and kill the one who has it. Upon hearing the news, Gandalf and he, along with Sam, escape. On their way, they met Aragorn, Legolas, Gimli and Boromir. All of them comprise the Fellowship of the Ring. So, what does it mean if you have a short summary for a very long story? It only means that it’s so hard to tell the story in words. I was definitely hesitant of watching this movie because I thought, in its length, I would be bored and uninterested. It was definitely the opposite of it. The movie gave an immense and wowing story of journey and adventure without even getting self-indulgent. Instead, it packs such an emotional way of telling the story that it does not get tiring in any way. It was presented in such an absorbing way because it was able to blend in the epic scope the story has and the personal core that it builds up with the characters. It’s not easy to handle such a lengthy story in a three-hour length because it definitely has the tendencies to be unfocused in telling the main story and be busy showing random things. The direction was focused and clear and there is a sense of expertise in it that is very comforting because this kind of story needs someone who can actually tell this and make this his own. Peter Jackson, being a creative and wildly imaginative guy he is, was able to make this epic fantasy with such originality and identity that it definitely stands out from the rest. Admittedly, this is only the first time I have seen a film in the Lord of the Rings trilogy and I could say that I have never been impressed by a fantasy film with this kind of level. Ever. All I could say is that this is one of the most amazing fantasy films ever, if not really the most. The direction does not sugarcoat what is happening in the story nor does it glorify the violence that it has. It attacks the material with such honesty that it did not bother me with every directorial choices that it made to present the story. The whole story was very well-handled that it stands out as one of the most compelling films in the history. That’s all I got to say. The screenplay is fantastic. It must have been a really hard to adapt the source material. Anyway, what impresses me is on how it was able to make a story filled with fantasy and at the same time, it never forgets the human soul the characters have. The characters could have been from an other world, but they have humanity in them. The relationship between Gandalf and Frodo is a beautiful illustration of a very humane existence of these characters. I was seeing a fatherly image in Gandalf to Frodo. But it was not stuck to that – it was not stagnant. Throughout the course of the film, there is a continuous development of characters. Not only the development of characters will I praise but on how it simply tells the story. The narrative flow is smooth without any obvious flaws or plot holes, if it even have one. There is such reason to everything that happens. There are parts in the movie when there are a lot of attacks that are taking place. And in for some reasons, it didn’t feel like randomly placed. The screenplay had logic so that in every event that is happening in the movie has a reason in this journey. This is not some questionable story because there is logic in it. That’s what most fantasy films need – logic. Another thing that I like about the screenplay is on how it was adapted. I haven’t read the book, but reading about the process the screenplay had undergone, it must have been a pretty hard time writing this, so there was some condensing and compressing done. And the result was the prologue – one of the best ever. It was written with such an admirable mystery and delivered with such agelessness and ethereal quality that it’s breathtaking to hear. The cinematography is….. what can I say? There is always two kinds of shot in this – the vast shots suggesting the epic scope of the film, and the confined shots, almost too close or simply moving – and both of these shots build up the feel of actually being there in the place. The wide shots, I expected them. But they are still done in a very beautiful way that it really was something new, at least for me. The close shots, especially the handheld ones, were the surprise because I would not think that they would use those kinds of shots in this kind of film. It adds up to the distinctive quality of the film. The colors used in the shots appropriately displays the mood in every scene. The editing is so smart with its different choices that adds up to the think that make this film stand out from other fantasy epic films. There are the battle scenes which are definitely the highlights of the film’s sharp editing, but as my personal preference rules, the part where the editing mostly works best was the first thirty minutes. It starts with images placed together to create a startling effect. After that is the scenes at the town, scenes that are filled with the feeling of being at home, thanks to the editing that actually juiced out the best of the story to create an opening that automatically evokes attention. As a whole, the film had plus points for me because of the editing. The music manages to surround the whole film with a certain atmosphere of magic and ethnicity. The notes could suggest traces of Titanic and Braveheart, but it does not matter. It suits the story the film has and what the film is all about – it is about a naive Hobbit initially in peace on an enchanting journey. It perfectly settles the atmosphere with its musicality. Special mention to the flute that echoes almost of the most remarkable emotions in the film. Of course, aside from the gentle music, there is the majestic music used for the traveling shots and the scenes where something bad is happening. All in all, the music adds a l0t to the film. Its mix of colossal music and subtle scoring fills the movie with life and soul. The song at the end caps the film in a high pitch, raising interest and anticipation for the sequel that it has. It’s with a sense of nature and enchantment in it. The production and technical facets of the film are almost pitch-perfect. The make-up is very believable in producing larger than life characters that populate the film. The costume design aren’t the glamorous that you will normally see being awarded for the best, but it adds a lot to the characters and their qualities. The art direction is effective in simulating a world we do not have an idea to start with. There could be words from the book illustrating the places, but it is actually the imagery and imagination of the designers that made this world something different. And it’s nowhere near distracting. The visual effects are one of the best ever. There is no way you can see any shot in the film that doe not look at least believable. Ten years have passed since it was first released and the effects haven’t aged a bit. It has intelligence and complexity in it, and there is undeniable display of effort in it. The film may have undergone such lengthy process, but the product is more than rewarding and satisfying – it’s spellbinding. The acting works more as an ensemble, but at least, I just want to say things about some of them. Ian McKellen successfully embodies what could have been an annoying one-dimensional character. But instead of doing that, he gets the best out of his character. His character is already enveloped in mystery once we see him for the first time. In the process, he gently peels his covering to show us who he actually is. It could have been an ignored work, but I’m glad it was recognized for its humanity. Elijah Wood brings a lot of joy in his character. There is a bite of childishness in his performance, but the whole transition that he undergoes throughout the film as he slowly matures is really good. He perfectly suits the character, and he does not show any shallowness in this. The other actors do also well, even if only in small doses. All of them create vibrant characters, full of life. No one is left out, no one gets to commit any flaws, and at the same time, none of them were completely remarkable. Still, such an impressive collaborative effort. The film completely took me by surprise. I expected it to be an exhausting film to watch, but I was thrilled. I can’t wait to see the sequel. I have no more words to say – I’ll let my rating speak. This entry was posted in Best Picture 2001, Best Picture Project and tagged The Lord of the Rings: The Fellowship of the Ring by Juan Carlos Ojano. Bookmark the permalink. Soooo glad you liked it! It’s my favorite of the trilogy and easily my choice for this year. McKellen should have won Best Supporting Actor, too. Really looking forward in seeing the other two parts but I already know they’d be great. McKellen is definitely Oscar calibre. Haven’t seen his competitors, but by just judging his performance here, he is worthy of a win.